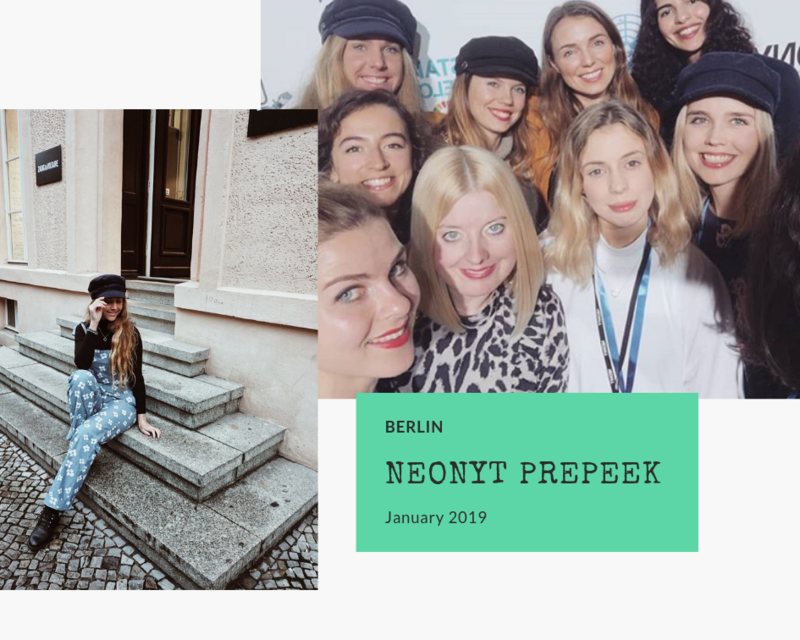 Together with Vepsi and a group of sustainable bloggers, I was invited to attend Neonyt – the sustainable fashion fair during Berlin Fashion Week. Curious to know what we did? Read along. Are Vepsi and Neonyt terms you’ve never heard of? No worries. I got you. Here it goes: Vepsi is a sustainable platform that connects brands to influencers, founded by Eilean and Leslie aka sassy Leslie from Paris. Eilean worked for around 6 years in the field of innovation and development at the UN. 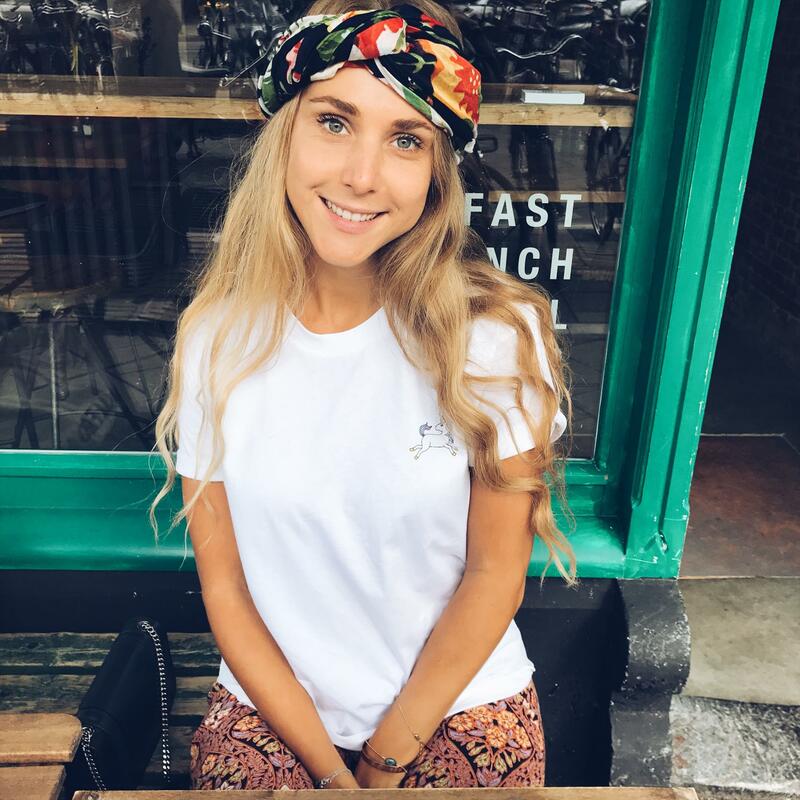 Passionate about fashion and fashion (blogs), she decided in 2015 to launch the VEPSI pop-up sales, bringing together ethical influencers and brands. These were the precursor to the startup. After three years of successful pop-ups – and after having finished eventually that Phd she was doing – she decided to uncover her true entrepreneurial spirit, quit the UN and create the start-up VEPSI together. Eilean and Leslie – who has been working as an Art Director in the corporate and luxury sector and was, like Eilean, always a fashion passionate – build on the sustainable pop-up experience VEPSI to make it accessible to all. This is how the new VEPSI was born: A agency-marketplace for ethical brands only, supported by fashion impact ambassadors (aka influencers) all over the world. The marketplace will be launched in April and focus mostly on sustainable brands of developing countries. They invited me and six other women from all over Europe to come to Berlin and talk about sustainable fashion. 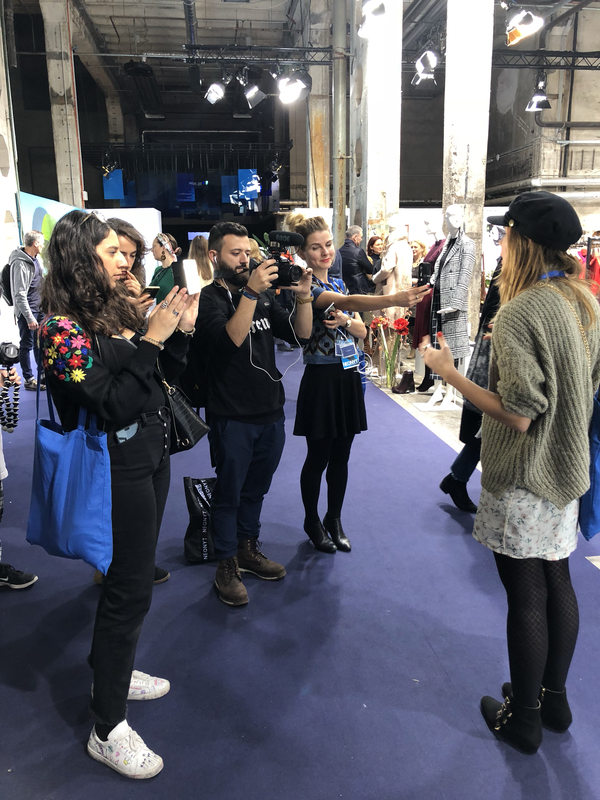 This we did at Neonyt, which is a big fair where people get to learn more about sustainable brands, but also about marketing and influencers. 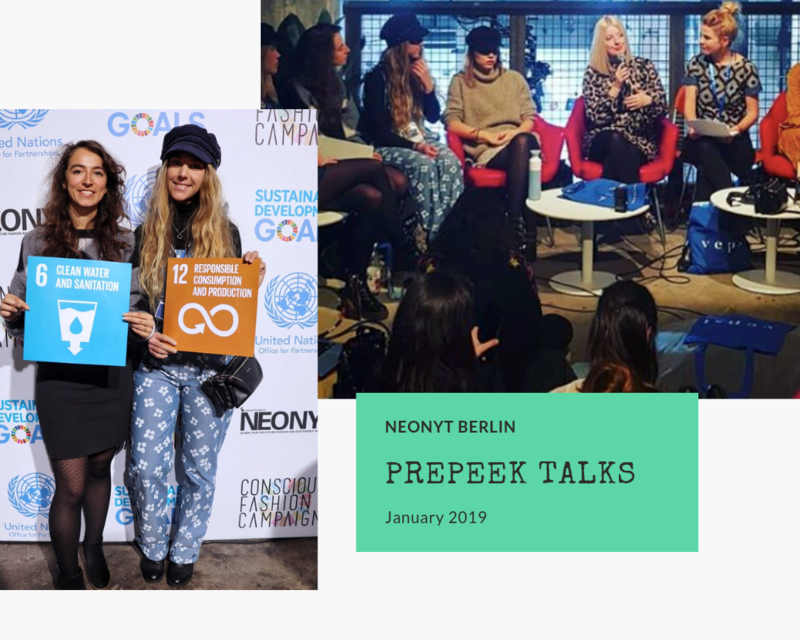 We were given enough time to get to know some brands and were asked to participate in two panels, one concerning the SDG’s (which I will tell you more about later) and one about sustainable influencer-marketing. While walking around at the Neonyt fair, there were some really cool fashion brands that I had never heard of. I didn’t get the chance to speak to everyone, but I did write down which brands I thought were interesting (and there were probably a lot more!). Sharing is caring, so these were the brands I wrote down. During the Neonyt fair, we were asked to do two panels, like I said before. The first one was about sustainable influencers and how they can be a powerful marketing tool. 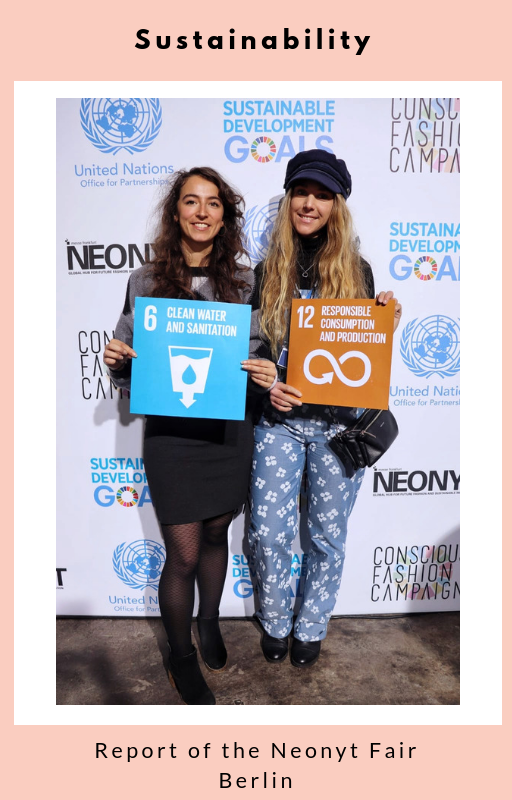 We discussed what makes it different to be a sustainable influencer, how it’s different to work with sustainable brands and we talked about the conflict of promoting consumption while preaching for a less waste lifestyle and less consumption. The second talk was ‘the big talk’, about the SDG’s. Now let me first explain to you what the SDG’s are. SDG’s stands for Sustainable Development Goals. The 2030 Agenda for Sustainable Development, adopted by all United Nations Member States in 2015, provides a shared blueprint for peace and prosperity for people and the planet, now and into the future. At its heart are the 17 Sustainable Development Goals (SDGs), which are an urgent call for action by all countries – developed and developing – in a global partnership. They recognize that ending poverty and other deprivations must go hand-in-hand with strategies that improve health and education, reduce inequality, and spur economic growth – all while tackling climate change and working to preserve our oceans and forests. I think the main focus of Neonyt is goal nr 12: sustainable consumption and production. Interested in learning what all 17 goals stand for? This short video will tell you all about them. Because there wasn’t enough time for everybody to answer the questions we discussed, here are some of my thoughts. In my opinion, there’s (at least) two ways to make a sustainable impact on Instagram. But even if you have just a few followers, you can have an impact on people’s decisions and motives. On the one hand you can have an impact by having a completely sustainable account that attracts people who already decided to make a difference in their life and want to learn more about how to change their habits into even more sustainable habits. On the other hand, there’s being a ‘regular’ influencer that informs their followers of how they are making more conscious decisions and tries to show that making sustainable choices isn’t necessarily very expensive, boring or impossible. Instagram is image driven, so I think it’s important to still be aware of how powerful the image you make is. I consider myself to be the last type of ‘influencer’. I share the things that are close to my heart (natural living, ethical living – but it’s all still a process for me) and I hope to inspire people to think for themselves and make more conscious choices. I hope to make them think ‘if she can do that, than I can do it too’. Berlin was an adventure and I would like to thank Vepsi again for organizing these amazing three days. Also a big shoutout to my fellow sustainable warriors, for being a huge inspiration.